Physical Description Idran like most Hirogen is of far greater height weight and muscular structure then most humans. Idran has a scar across him stomach, gained well hunting an extremely dangerous prey. Idran has the markings of his tribe carved into his upper back and right shoulder. Idran is extremely proud of his cultural heritage tracing his tribes roots back to the planet of origin. Idran holds a strong belief in the chain of command gained through many years on the hunt. He will show the up most respect for his superior, only challenging the superior when he feels the welfare of the tribe is endangered. On the same note Idran believes that those under him should have nothing but the up most respect for him, any sign of less is taken as an insult, and a direct challenge to his authority. Idran is considered calm compared to most Hirogen, however if his honor is challenged he will go to tremendous lengths to shame the challenger. Idran's greatest strength is his tactical brilliance. From his years on the hunt, and Beta on his vessel, Idran learned the fine art of managing his men, and stalking prey. Idran’s extremely strong willed which can be both an advantage and a disadvantage. Perhaps his greatest disadvantage is Idran’s temper. Once he is angered Idran can become extremely violent, and has in fits of rage severely injured three members of his tribe. Idran is content to serve on a star fleet vessel. He has no strong desire to move upward in federation ranks. He only seeks the means to return to the delta quadrant. 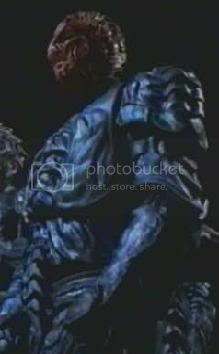 He like all Hirogen lives for the hunt and wants no more then to once again stalk prey across the far reaches of space. Like the majority of Hirogin Idran's primary interest lies in the collection or rare trophies from the most challenging and dangerous prey available. The Hunt drives Hirogins, demands they maintain physical and mental acuity beyond that of the species they peruse. Idran was born on the Rotara, one of the Keltar hunting craft. His clan was well respected, and had taken part in many successful hunts. When idran came of age he joined the Levtar, a smaller hunting craft in his clan. He earned prestige as a glorious hunter. 4 years after coming of age Idran was moved to the Lovak, one of the clan's two Keltar class vessels. He rose through the ranks engaging in many glorious hunts. Like most Hirogen vessels the Lovak moved constantly in search of new prey. Idran eventually advanced to the position of Beta. On a hunt in relatively unexplored space the Lovak encountered an unknown energy vortex. This vortex was in fact a Borg trans warp conduit. The Lovak was flung across space, and ultimately ended up in the alpha quadrant. The alpha quickly realized there would be no easy way to return to the delta quadrant, and the Hirogen way of life would not be maintainable in this vastly different landscape. The decision was made to join the federation simply to allow the loan hirgon hunting party to survive. Idran resented the decision, but agreed it was the only reasonable course of action, in this strange environment there was no other way to survive. Idran joined star fleet in the hopes of perpetuating the hunt, but was disappointed to be assigned a position at Starfleet academy. Despite his initial resentment Idran found teaching to be quite fulfilling. Starfleet felt Idran’s time as Beta, leading hunting parties in the ruthless untamed expanses of the delta quadrant, more than qualified him to teach small group tactics. Idran found it invigorating, teaching young Hunters to stalk their prey, and to take pride in the hunt, and while the holodecks could never present a satisfactory trophy, or accurately recreate the thrill, the danger of the hunt, it was for a time satisfying. After nearly 4 years of teaching Idran requested a transfer out of the Acadamy. He longed for the thrill of the hunt, to be in the thick of things once more. In light of the growing cardassian threat Starfleet approved Idran’s request, and placed him in command of the Black Watch, the marine detachment aboard the USS Relentless. Idran found himself disappointed with his posting aboard the Relentless. Life aboard a Federation Starship was vastly different from life aboard a Hirogen ship. He had trouble developing relationships with other officers, leading him to feel isolated. While Hirogen’s had rigid beliefs and command structures, they were by no means solitary hunters. He found himself slipping into depression. It wasn’t until his first mission that he found his place within his new hunting party. He had truly taken the place of Alpha within his pack, but that role did not preclude him from living amongst his men, as he had once thought it had. He took on his role with a renewed sense of pride, once again taking the role of teacher, drilling his men, sharpening for the battles he would lead them into. For nearly 5 years he served on the Relentless, watching the ship change hands, the crew rotate, and his clan grown and shrink. He built a new world for himself on that ship, raised it from nothingness, bringing his hunting grounds to the alpha quadrent, while still finding a way to live by the laws that had been thrust upon him. Then, the order came down, the Relentless was to undergo a refit cycle, the crew was to be disbanded, and Idran was to be placed in command of Outpost Lucerne. Idran was admitadly excited at the prospect of taking command of an entire outpost, to truly take on the role of alpha, and be subservient to no man, but he had come to consider the Relentless his home. He had come to consider the men and women he served with his clan, to abandon that, to turn his back on all he had known for 5 years, would be the hardest sacrifice he would ever have to make, but he understood his orders, and followed them.